Custom Muslin Bags - Bulk Custom Muslin Bags - High End Bags & Quick Turnaround Time! 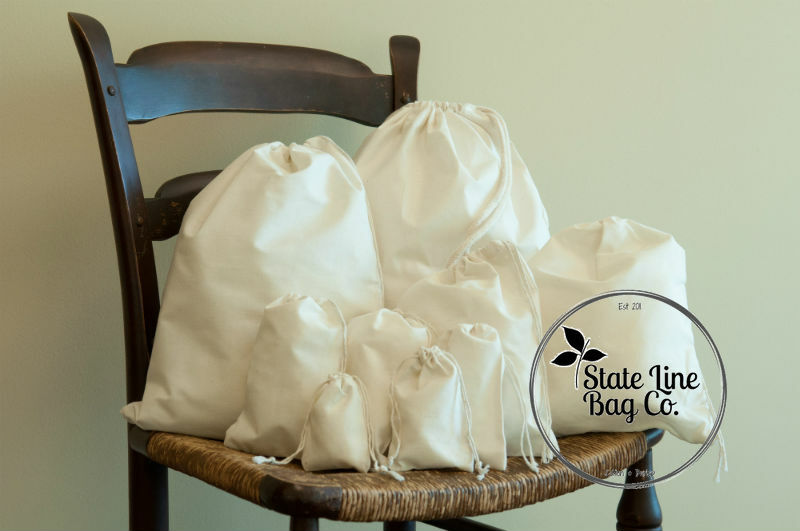 With over 1,000,000 bags in stock, State Line Bag Co. is a preferred provider of wholesale custom muslin bags. When your order is placed prior to 1 p.m. Central time you can rest assured your custom muslin bags will be shipped the same day - and rock-bottom prices along with superior products will draw you back again and again, along with our outstanding customer service. We offer a huge line of wholesale custom muslin bags for individuals, small businesses, mom & pop shops, or large organizations. Although our quality is exceptional you will always enjoy affordable prices with State Line Bag Company. Our custom muslin bags are plain so that customers can use them any way you please, or have our team print or personalize your bags for you. You will find online suppliers of custom muslin bags who offer cheap prices, however quality is usually compromised in an effort to make as much money as possible. At State Line Bag Co. you will find our custom muslin bags in bulk are of superior quality without the superior price tag! Your satisfaction with both our products and prices is our #1 priority. No order is too large or too small, and our creative staff is happy to personalize our wholesale custom muslin bags to your needs. At State Line Bag Company we believe in working with customers closely in order to deliver beyond your expectations. Printing or personalizing your bulk custom muslin bags is no problem at all! From small custom muslin bags for gifts to larger sizes ideal for toting around, we have several sizes to choose from including 2" x 3" to those as large as 10" x 16" and everything in between. You can rely on State Line Bag Co. for all of your wholesale custom muslin bag needs. Exceptional quality, super-low prices. Contact our friendly team today at (913) 269-6404 or email us at https://statelinebag.com/contact-us.